Breyers Peanut Butter Cup Ice Cream | DidjaEat? On my way home from the Phillies game, my car somehow guided me to Wawa and whispered that I should buy some ice cream. I found the Wawa and, after literally 15 minutes of intense deliberation, I decided on Breyers Peanut Butter Cup ice cream. I am not a ice cream freak, nor am I crazy about peanut butter. I mean, I like it, but I won’t sell my mother for it (I am sure she would appreciate that). The problem with peanut butter flavored things is that they often taste grainy or so artificial that it immediately turns me off. However, I am a big fan of Breyers Ice Cream. I haven’t had it for awhile, but at my cousin Michele’s house a few weeks ago I had some mint chocolate chip and forgot how good it really is. The smooth texture is a not silky smooth but it’s as close as you can get in a store bought ice cream. That goes far for me. 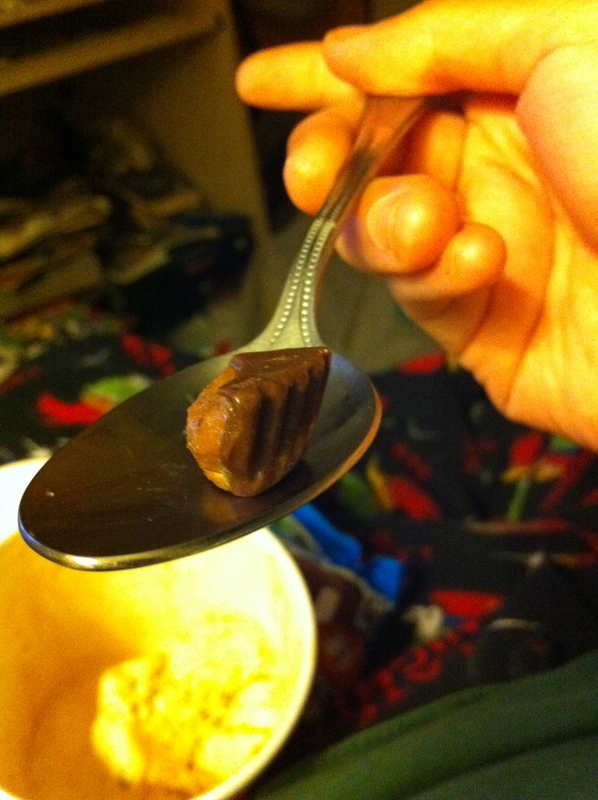 I enjoy a Ben and Jerry’s pint once in awhile, but it annoys me to have to jam my spoon on there to get a spoonful out. 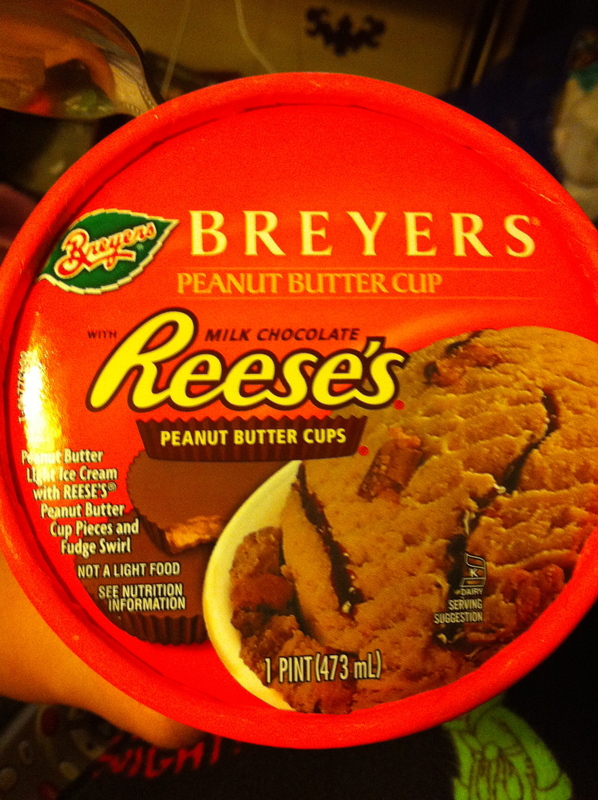 This Peanut Butter Ice Cream is paired with the Reese’s name, as you can see in the above picture. It has light peanut butter ice cream with Reese’s peanut butter cups and a fudge swirl. The fudge swirl was ok but I was super impressed with the big pieces of peanut butter cups in this pint. I’d say they were about the size of a half of a halloween little reese’s cup and the pint was littered with them. The ice cream itself, well, it was pretty great. It wasn’t overly sugary or gritty, but it’s “not a light food”. Under the nutritional info it says “The Light Ice Cream in this product 50% less fat and 20% less calories then regular ice cream”. So, basically they say the ice cream is a little bit better for you but we won’t talk about the sugar. What really cracks me up is on the nutritional info label, it says a serving is a 1/2 cup and there are 4 servings. Do you know anyone who can get 4 servings from a pint of ice cream? Let’s get realistic, people. I ate this thing while watching a dvr’d episode of “The Closer” and was done before the episode was over. With 18 grams of sugar times 4, you end up with 72 grams of sugar, more then a days worth. But then again, if you are buying something like this, the last thing you are thinking is “what a healthy snack”. So there ya have it. If you have a hankering for Peanut Butter Cup ice cream, you could do yourself well by picking this ice cream up. It was $2.99 at Wawa, compared to $3.29 for Wawa brand and Edy’s and the $3.99 for Ben and Jerry’s. Posted on September 7, 2010, in junk food and tagged breyers ice cream, frozen desserts, peanut butter cup ice cream. Bookmark the permalink. 1 Comment. I’m glad you won’t sell me for some peanut butter, but it makes me wonder what you would sell me for. On second thought, maybe I don’t want to know.